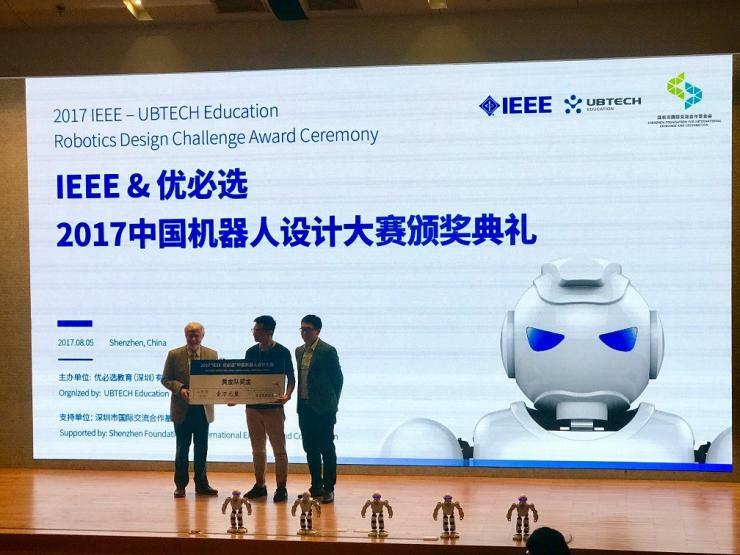 GT Shenzhen graduate student Fandi Peng receives the 2nd Place Award in the 2017 IEEE UBTECH-Education Robotics Design Challenge. A team of Georgia Tech-Shenzhen graduate students earned the second place spot in the 2017 IEEE UBTECH-Education Robotics Design Challenge on August 4, 2017, in Shenzhen, China. The team consisting of Fandi Peng, Melvin Mathew, Siddhartha Jaitly, and Aishwarya Balwani, finished second among the 26 teams that advanced to the final round of competition. The GT-Shenzhen team received a gold award and 10,000 RMB in prize money. More than 100 teams involving 800 students from different universities in China signed up for the competition. After months of hard work, the GT-Shenzhen team produced a winning design which is a Python framework for UBTECH’s alpha robot so that users can learn coding online easily and interactively with the robot. Team lead Fandi Peng was inspired to create a “plug and play” platform for kids to easily learn programming. Peng, who had previously taught children to program as a volunteer with a technology and science museum, noticed that there was a steep learning curve due to the tedious configuration process for the software and hardware learning environment. “In the competition, we took this idea forward and developed a Python framework for UBTECH’s Alpha robot, running on a Raspberry Pi server, so that kids can access the learning environment through the browser of any online device. They can start coding immediately, play with different sensors, and learn interactively with the physical robot,” Peng said. Peng completed his master's degree in ECE in 2016 from Georgia Tech-Shenzhen, and earned his second master's degree from Georgia Tech this month in the OMSCS program. Other team members include Melvin Mathew, Siddhartha Jaitly, and Aishwarya Balwani who are all graduate students pursuing master’s degrees in ECE at the Shenzhen campus.